Final projects for the 2012 Certified Public Manager program graduates have been received in the State Library and are available to view in the library. These projects are the culmination of the program administered by the Office of Human Resources of the Budget and Control Board. Is your SC State Government Agency interested in hosting a State Library representative for a Lunch & Learn during September? As the U.S. Supreme Court makes its historic decision on The Patient Protection and Affordable Care Act, the authentic, electronic version of the law is available on the U.S. Government Printing Office's (GPO) Federal Digital System (FDsys). 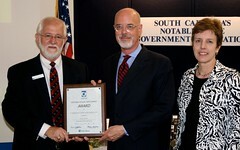 2011 notable documents of South Carolina and of Federal Government agencies are featured in a new display at the State Library. National Hurricane Preparedness Week 2012 runs from May 27th through June 2nd. Be prepared with these important resources! The Census Bureau has released an estimate of the undercount and overcount in the 2010 Census, providing a measure of the accuracy of it. The results found that the 2010 Census had a net overcount of 0.01 percent, meaning about 36,000 people were overcounted. LOOK AT ME! Do I have your attention? What do I need to do to change the world? Catching the attention of a passerby or reader can be a challenge. The South Carolina State Library offers many new and interesting resources each month. Attention DHEC Staff! 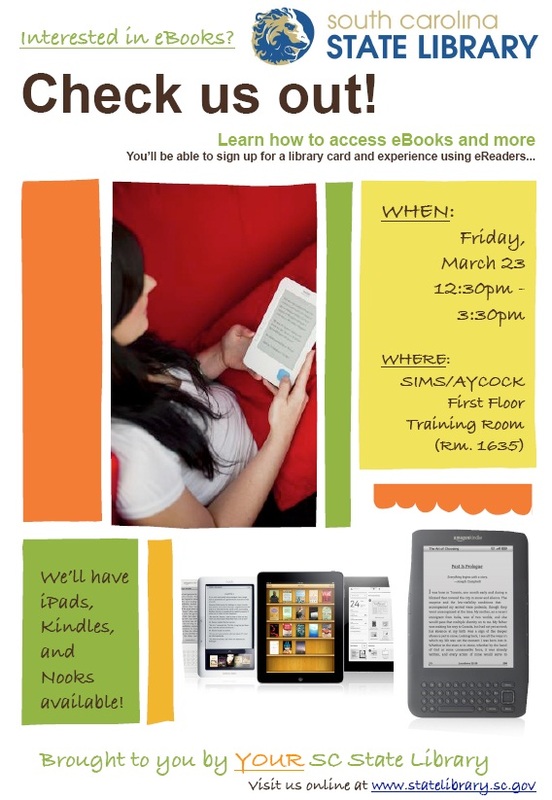 Are you interested in learning more about eBooks? Because it is a Federal Documents Depository, the South Carolina State Library has received a four volume set of the Budget of the U.S. Government published by the U.S. Office of Management and Budget.